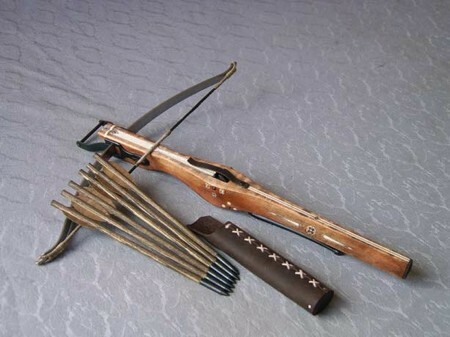 A crossbow is a traditional medieval weapon used in war by warriors. It is believed to have first appeared as a weapon used by the Chinese around the 5th century. It became a widely used weapon even by the ancient Greeks and Romans because of its capability to maim their opponents. Whereas an ordinary bow and arrow relies on the strength of the archer, a crossbow’s strength lies in its mechanical trigger which generates enough force to penetrate even layers of protective armors. Today, a crossbow is only used in hunting and target practice. Print-out a copy of the diagram below and cut your pine wood according to the measurements of the two major parts (number 1 and 2) as shown. On the larger piece of wood (#1) we will build the firing mechanism. To assemble the firing mechanism, saw one face of a small wooden block (2 x 2 inches) with one face of the block having an angle that is less than 90 degrees. 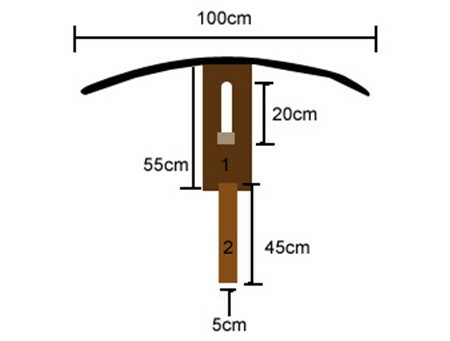 With the angled face pointing towards the head of the crossbow, mount the block 20 cm from the bottom of the biggest wooden piece (#1) with a hammer and nail. Nail in four stacks high of wooden ice cream sticks on both sides of the wood block to cradle the door latch in. Then, screw in the door latch on the wooden block. Nail the handle (#2 wood block) to the main wooden block. Cut notches on both ends of the bamboo sticks then tie them tightly together to both ends with wire. Bind the center of the bamboo sticks with more string to make it sturdier and easier to attach to the crossbow’s body. Tie the nylon string on the notch on one end of the bow (bamboo sticks). Bend the bow firmly and tie the loose end of the string on the other side of the bow. Nail the bow onto the head of the crossbow body. Load your crossbow. Simply pull the nylon string to make the bamboo sticks bend, and then hook the string under the door latch. When loading the bow, aim it downwards to prevent accidental release and accidents. Avoid using sharp objects for the crossbow. Instead, use unsharpened pencils or pencils with a blunt tip. Restring your bow every once in a while to keep it taut and springy.